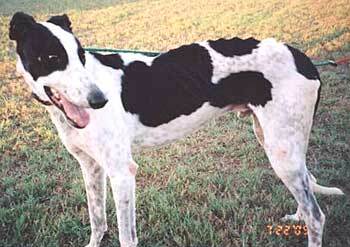 Moses, aka R's Freckles, is a 8-year-old white and black male greyhound born December 15, 2000. His sire is My Rooster and his dam is R's Zippitty Zip. Moses was found along with Noah as strays on FM 1388 between Kaufman and Kemp, Texas, wandering with no collar on. Fortunately for both of these boys, they were picked up by a local resident, Donna and her husband, Mike, who are avid animal lovers. Moses, like Noah, was heartworm positive. He has completed his treatment and now is heartworm negative! 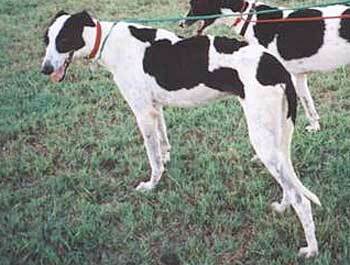 He also tested positive to Ehrlichia, was treated, and is now negative to that also. Moses is small animal and cat tolerant. Moses was in a home for three years, but has since returned to GALT due to a change in family circumstances and no fault of his own. This darling older boy is ready to be homeward bound once again! 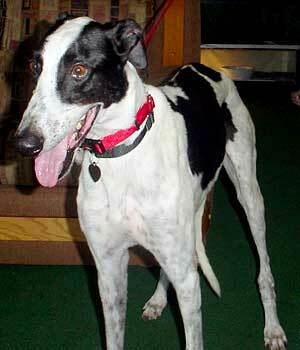 When Moses was found he was very underweight, and tested positive for heartworms and Ehrlichia (tick-borne disease). Over the past couple of months he has successfully completed all treatments and is now a healthy happy boy who is ready to be adopted to his forever home! Moses is house trained, but should be let out at regular intervals during the day, since he does not give any signals when he wants to be let outside. Moses is fully crate trained, and will willingly enter his crate with the command "In your house", because he knows that when he enters his crate he gets a cookie. He often will go in his crate to take a nap in the afternoon without any prompts. He is very well trained and will not try to get on human furniture, but loves a good fluffy dog bed! Moses loves his food! It's the first thing he thinks of when he wakes up around 7 am, and the first thing he thinks of after his afternoon nap around 5 pm. He jumps up and down like a jumping bean until his foster mom lets him eat - and the food is gone in less than 60 seconds. He is not food or treat aggressive, and will allow you to take away any food, treat or toy without any issues. Moses has a tendency to hang out in the kitchen while his foster mom cooks, as she is pretty clumsy and has been known to drop yummy bits of food (which he thinks are especially for him). He has never counter surfed in the kitchen, but he has thought about it. Moses is definitely not an alpha dog. He gets along well with many other dogs, and he will always act submissively towards them during play. Moses is also very smart - he can tell time! Around 9:30 pm every night he knows it's time to go out for his walk. Short or long walk, it doesn't matter to him, he just wants to get outside and see the world for a few minutes. He will walk very nicely on a leash without pulling, but he has a tendency to switch from your left to right side, and then back again as he takes in all the great smells of the day. It sometimes helps to walk him on the right side of the street, so that he is on your left side which is near all the mail boxes. All those good smells from the mail boxes keeps him occupied and on your left side. Moses is cat tolerant inside the house, but when he is outside he is easily excited by rabbits, birds, cats and small dogs. He does very well with small children. He will stand there like a perfect gentleman and allow people to pet him, and the high pitch squeals and screams from the neighborhood kids don't seem to faze him. Moses is a very sound sleeper. After his 9:30 pm walk and cookie, he runs upstairs and grabs his favorite dog bed and hunkers down for the night. He sleeps much more soundly than during the day, and can be difficult to wake if you want to move him into another room once he's fallen asleep. Like we said earlier, Moses is crate trained and will sleep in his crate, but he'd really prefer it if the crate was at least in the same bedroom as his parents. Otherwise he gets lonely and might whimper. Moses tends to rise with the sun, which right now is around 7 - 7:15 a.m. Despite eager attempts to get him to sleep later, his clock is set at 7ish and that is when he wants up. Moses is one of the best greyhounds I have ever had the pleasure of fostering. He is so easy going. Being a very mellow dog, he sleeps on a dog bed soundly while I cut or dremel his nails. While in the car, he will sit on a dog bed so that he can see out the windows. His favorite toys are the fluffy stuffed toys that have squeakers in them. He is a good boy in that he doesn't shred his toys, so they do tend to last a while. Moses does fine while we are away at work. He's always had other greyhounds around him while we were away, so I can't say for certain how he will do when completely alone. He tends to just sleep when home alone. Left out in the house or crated - he will do fine either way. He does recognize the doorbell and will go to the door when he hears it, but he does not bark. Moses is the most affectionate, loving, sweet greyhound I have ever met! He is just sweet as pie. He loves it if you lie down on the floor next to him or on his dog bed with him and ask him if he wants to cuddle. He will roll onto his side and lean into you so that you can cuddle with him for hours! He is very curious, and will tilt his head to the side when he sees something new that he is trying to figure out. He does not bark, unless you get him all riled up during play time. He is a super companion dog! If I am ever feeling under the weather, he seems to know, and will find me and just lay down next to me to let me know that he is there. ..and he's quite handsome too! Just an all-around great dog with a heart of gold who can't wait to share his love with his new forever family!